Many of us have had that sinking feeling of finding a dead pixel in their display of a new device, either immediately after unboxing the item or shortly there after. I myself have just run into this situation after purchasing my MacBook Pro, and no matter how small the speck is – I mean a single pixel is pretty small – it always seems you eyes fixate on the small annoyance. In the case of Apple it has always been a bit of a mystery as to how many pixels need to be dead on their displays, both large and small, before they would repair or replace the display in question. Well, yesterday BGR has apparently gotten his hands on a screenshot of the official Apple policy on dead pixels. 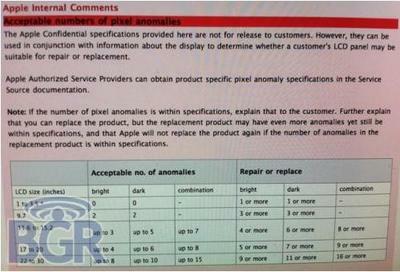 According to this confidential internal correspondence, the number of dead pixels that warrants replacement or repair is based on screen size and whether the pixel in question is bright or dark. 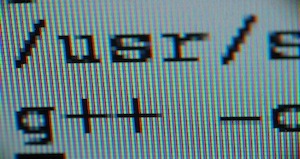 This document also outlines the acceptable number of dead pixels per unit. For example, screen sizes 1 to 3.5” inches, aka iPhone and iPod Touch, have a zero acceptance rate. In other words, if there is even one dead pixel, be it bright or dark, Apple will repair or replace the device. On larger screens such as iMacs 17 to 20-inches, Apple will repair or replace the unit when dead pixel count reaches 5 bright, 7 dark or any combination of 9 dead pixels. Of course Apple Policy allows for staff to use their best judgement in relation to making replacement decisions. The entire chart obtained by BGR is shown below. I find these numbers very interesting if for no other reason that I have never heard of a situation where a person was denied repair or replacement of a device with even one dead pixel. My MacBook Pro had a single dead pixel and after two weeks of waiting to see if it would correct itself, I walked into the Apple store and walked out with a replacement 15 minutes later. Apple tends to make it’s customers happy, hence the “fanboy” tags that are thrown around. If you think about it, would you, as a company, want potential buyers seeing your product for the first time with a dead pixel? It reminds me of a quote from the legendary Yankee, Joe DiMaggio when a reporter asked why he plays so hard everyday: “There is always some kid who may be seeing me for the first or last time, I owe him my best.” That quote really sums up Apple’s quality standards. What has been your experience with dead pixels or defects not only with an Apple product but any product you have purchased?